The Treen Mandrel, available from The ToolPost, is a fairly simple piece of equipment which is used as an aid when making boxes. The box is made in three parts - the box, the lid and the spigot. The spigot and the lid are made separately and joined together with thread inserts and a threaded coupler. The thread inserts are also used to attach the spigot and lid to the lid mandrel. For air-tight sealed lids, some thin cork sheet is supplied, which can be cut and used to make a gasket on the insert. 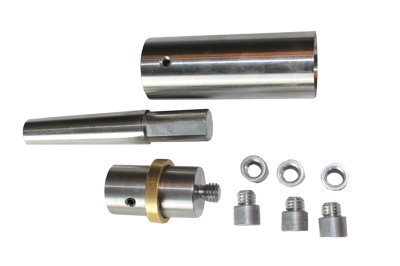 The Morse taper stub is threaded so a draw bar â€“ not supplied â€“ can be used to secure it on the lathe spindle if required. I roughed down a piece of ash (Fraxinus excelsior) and cut it into three pieces. I formed a chucking spigot on one end of each piece so I could drill the necessary hole - the holes could also be drilled off the lathe. Using a 32mm Forstner bit, I drilled a 75mm deep hole in the box part. The limit of depth on the box mandrel is around 85mm. The base of the lid and the top of the spigot were trued up in the chuck and a 12mm hole was drilled in each to a depth of 10mm to accommodate the thread inserts. Now I had my three pieces of wood to use on the mandrel. I glued the thread inserts into the lid and spigot so it had time to cure while I turned the box. I attached the box mandrel to the Morse taper stub and mounted it on the lathe. I used the live centre in the tailstock to keep the workpiece pressed against the mandrel while I turned the outside to the desired shape. I went for a simple design with a bead at the top and bottom. I also cut away the chucking spigot from the base and formed the bottom of the box with the tailstock removed. Just the friction between the box and the mandrel was enough for me to do this. I was able to sand and finish the whole box on the mandrel. the final diameter, I checked the fit between the box and spigot and I was pleased to see that it was right first time. The lid was then fitted to the threaded lid mandrel, turned to the final shape then finished. All that remained was to join the spigot to the lid with the threaded coupler and the box was then complete. The Treen Mandrel offers a different way to make boxes - as long as the internal diameter is 32mm. It also allows a bit more leeway with the spigot and if a mistake is made with this component, another one can be made without affecting the rest of the lid. The mandrel simplifies box making by taking away the need to make jam chucks or to have a tight fitting lid so it can be turned on the base. All in all, this piece of kit is a good buy.